Is it breakfast? Or is it a side dish? My husband and I can’t seem to agree. 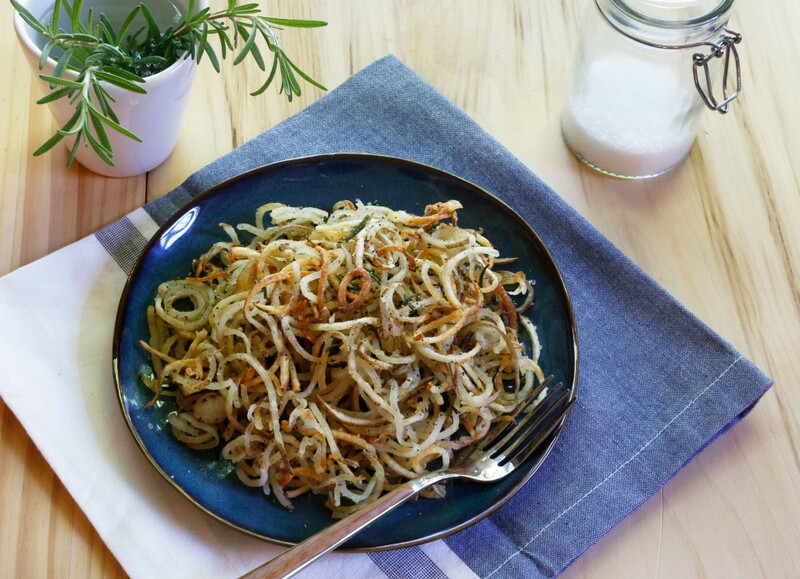 I think this recipe for Spiralized Potatoes with Fried Rosemary seems more like a dressed up hash browns. He thinks it would be the perfect accompaniment to something meaty. What we can agree on though is that they are crispy, and delicious. There’s a couple things at work here. First, I’ve been eyeballing spiralizers for awhile now but kept talking myself out of it. As my mom would say, “You need another cooking gadget like you need a hole in your head.” But then Amazon was having a big sale one day and I pulled the trigger. One spiralizer, coming right up. I got it and it sat on the counter for days. Ok… maybe weeks. Besides zoodles I wasn’t quite sure what to do with it. Then this summer I made watermelon dish with fried rosemary and I can’t stop thinking about that fried rosemary. I want to put it on everything. And since I’m from Idaho and all, potatoes topped that list. 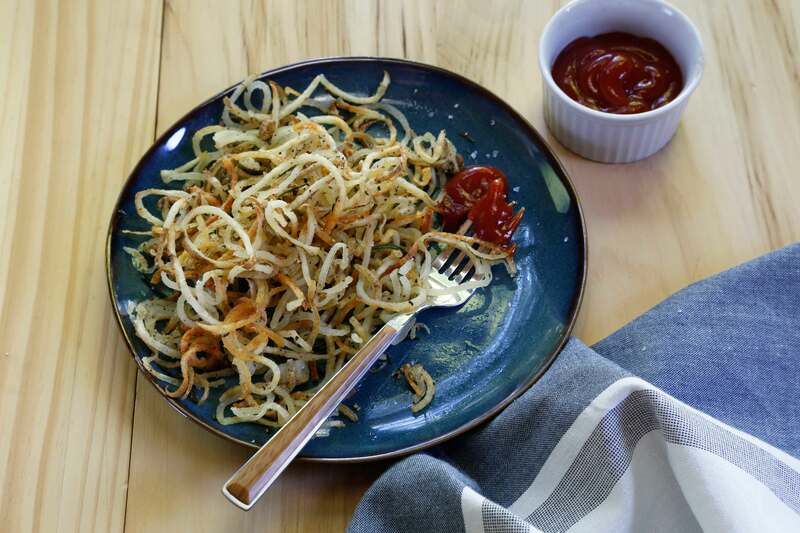 As for the dish, I’d say its a cross between hash browns and curly fries. So, in other words, pretty much perfect for any meal. There's no measurements in this recipe because it's easy to make as little or as much as you need. The fried rosemary takes these potatoes, great for breakfast or as a side dish, to a new level. Spiralize the potatoes, Lay on paper towels or a dish towel and squeeze to get as much moisture out as possible. Place potatoes in a bowl and toss in corn starch to lightly coat. Heat enough oil to cover the bottom of a large skillet over medium heat. Fry rosemary until crisp – about 30 seconds. Transfer to a paper towel to drain. Add potatoes in a single layer to the rosemary infused olive oil. Season with salt and pepper. Cook, turning, until potatoes are golden brown. Crumble the fried rosemary over the top and serve.